Welcome to my Bold Baking Bootcamp! In this limited series we will cover Baking 101, like conversions and substitutions in baking. In this first episode we are starting out with a weight conversions for baking ingredients. Now you tune in from all over the world to watch and make my recipes. However, you don’t all use the same weight conversions. Some countries like Ireland use grams and ounces and in the U.S. we use cups. Growing up in Ireland, I couldn’t make a recipe if it used cups as the measurement. So it is important to me that no matter where you live or what metric you use, you can make my recipes. 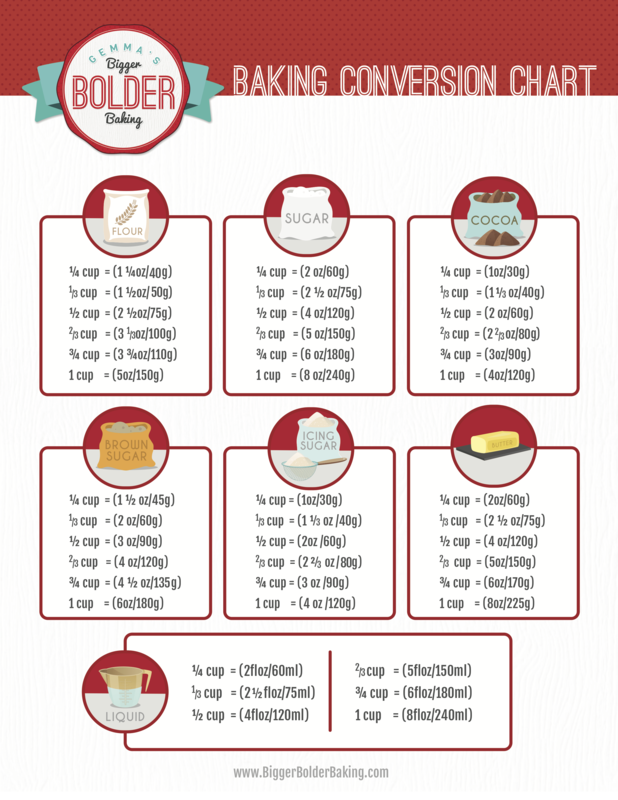 I created this Free Downloadable Conversion Chart that converts all of the basic baking ingredients from cups to grams and ounces. IMPORTANT NOTES: These measurements are based on my learning and experience. You might notice other charts vary and that can be for multiple reasons (e.g. different flours weigh different amounts or you scoop rather than fill your measuring cup). I measure each 1 oz as 30g, not 28g. As long as you consistently use my chart for all of the ingredients your recipe will work out great. Now, take for instance flour. 1 cup is equal to 5oz or 150g. However 1 cup of sugar is equal to 8oz or 240g. You will see that the same 1 cup measurement doesn’t always equal the same in grams and ounces. The reason is that 1 cup of sugar isn’t the same weight as flour because sugar is heavier than flour. You will see that all ingredients are different weights but if you use my chart you can easily see how to convert weights including liquids in any recipe. Liquid is measured in milliliters and fluid ounces. If you know anyone who would like this chart then share this chart with them. It will come in really handy when you come across an amazing recipe but it’s in cups or another measurement. The next episode of my Bold Baking Bootcamp is sugar substitutes coming Monday, January 9th. I’ll share how you can substitute regular white sugar for all natural sugars like honey, maple syrup and stevia. If you like this conversion chart and find it helpful I also have an Egg Substitutes Chart that easily shows you how to substitute eggs in any recipe using regular ingredients like bananas, apple sauce and buttermilk. And for more Baking Basics, check out my Best-Ever Buttercream Frosting, How to Make Rolled Fondant and Homemade Condensed Milk videos and posts. THANK YOU Gemma for this. I’m forever looking up conversions as I only bake with a scale. So often if I’m feeling lazy I dismiss a North American recipe because it’s too much work converting. And those are the norm here, as I’m in Canada. This will be a lifesaver. I’ll be laminating it and putting it under my scale. Liquid ingredients would include water, milk, buttermilk and oil? I have seen a recipe that calls for 165 grams of eggs, how confusing is that? Isn’t it just easier to give the total count of eggs? Do people actually weigh eggs after cracking them? Yes, some people do weigh eggs, especially in catering kitchens, as a little too much in one egg can be a big problem when there are 48 eggs! At home I have never found it necessary, it certainly is a liquid ingredient, but I trust the sizing given on the pack to work for me. That is really too bad, I am sorry that he has these issues, so hard to avoid all of those ingredients. I am thinking coconut, not a nut as such, but a drupe. (https://www.biggerbolderbaking.com/3-ingredient-coconut-cookies/). These have granulated sugar as an ingredient, but this could be substituted with an alcohol sugar, such as xylitol or erythritol, if that is at all permissible. (https://www.biggerbolderbaking.com/paleo-pancakes-4-ingredient/) this pancake recipe may be a good idea too, the sweetness comes from the bananas, no sugar added, and no gluten either. You could use an apricot sugar free jam for the sauce, sieved, with a little lemon juice. I hope this is of help. Sugar in particular is tricky to avoid in baking, it has a number of functions in baking, including adding crispness to cookies, or to bind ingredients as it dissolves. However, there are ways and means for everything, and banana or applesauce can give a little sweetness, substitute for eggs, and oil, and are nutritious too. Hey, Gemma, I’m trying to convert a recipe from Imperial (cups)into grams so that I can make ahead of the ingredients. I do this with my corn fritter recipe….the dry into baggies ahead of time so that when I have my wet ingredients I can make it up. It is easy enough to convert from Imperial to grams, these are measures of weight, there are a number of tools online to help. Google ‘ozs to grams’ and you will bring up a calculator, then sit down with your recipe and convert. I would need to have the recipe here to do it. The big difference would be if they were cup measurements, which are a measure of volume, not weight. The way to understand this is to compare a cup of rocks with a cup of feathers, not at all the same weight. so 1oz = 28.34g etc. The ingredient does not matter, weight is weight! Hi gemma. Recently i came across a recipe i wanted to try but its in grams. Your chart has helped me a lot but the recipe requires 550g of milk and 100g of cream? I was hoping u could help me on how much that is in cups? really glad you find this useful. Hello Gemma, when i look at your baking conversion chart for flour I see 1 cup is equal to 5 oz / 150 grams. i was always under the impression that 1 cup of flour is equal to 125 grams. Can you please explain to me alittle why some sites show 125 grams where your site should 150 grams, when you are baking something with several cups of flour it could make a huge difference in weight. The difference is explained by how you load the cups, and of course the variation in ingredients. I have seen a cup of flour weighing between 120-150 grams per cup. 120 grams is gotten by the spoon & sweep method used by King Arthur flour & others. 150 grams will be the amount using the scoop & sweep method. Personally, I always weigh mine & go with 128 – 130 grams for a cup. I am not sure what King Arthur has to do with it! Hello Gemma, your chart is really useful. I am going to print this. I have a doubt, kindly help me clear it. I don’t even know whether this makes any sense. My doubt is how do we measure butter in a cup? Is it by cutting the butter into cubes and adding to the cups? Or is it by beating the bitter initially and then adding to the cup? Help me clear this. I do not have a digital scale at home. Yes, I hear you! If you measure by scales a cup of butter will be 8ozs/250g/2 sticks. Liquid butter is the same, a cup of melted butter is 8 ozs. I am a bit confused with your conversion chart from cups to grams. I have check from other websites (eg: https://www.kingarthurflour.com/learn/ingredient-weight-chart.html) that 1 cup of flour is equivalent to 120-125grams but according to your chart its 150grams. Can you please explain the difference. Thanks. Yes so the reason mine is 150 is because I measure it by a 30g ounce. King Arthur rounds down. I’m in the middle of updating this chart to go by a 28g ounce which is more precise, giving you 142 instead of 150. Can you tell me where you got your weights? I printed out your chart to laminate for easy reference and then saw another that had weight of sugar and flour out by over 40g each so I tested it on my own kitchen scale and got the same discrepency. So I got these weights myself form my scales. I weight all the different ingredients multiple times to make sure I had the correct info. I measure 1 ounce as 30g. Some people do 1 ounces as 27g. Which cup measurement are you seeing a difference? I am trying to make macarons and it said I need 5 ounces of egg white and I don’t exactly how many egg that is so can you please help. That is an odd way to describe egg white, but it is a tricky thing to make, so I do understand why! A large egg (UK) Extra large egg (USA) will weigh about 60g. 60g is a touch over 2ozs. 40g of this will be the white of the egg and this is about 1.5ozs, a little shy of this. So, though it is difficult to be totally accurate without weighing it the egg requirement for your recipe will be about 4 egg whites. Tip: Pour the egg whites into a plastic food bag to weigh them, this will allow you to remove a little for accuracy. The egg yolks can be used for pastry, cookies, creme brulee etc. Lots of recipes here for you. I know JAck, I did not think of it. One tablespoon of powdered milk will be about 15grams. About 0.5 ozs. Hi Gemma thanks for this chart it’s a life saver for me because people here (Kenya) use cups or grams and it’s confusing to master the rarios. Cup measurements are based on an informal system of measurement, prior to home weighing scales. People would share recipes based on their kitchen cups, it did not matter the weight of the ingredients, or the size of the cup, as long as the same cup was used to measure all of the ingredients, in any one kitchen. It a measure of volume. Once the balance is right, then all will be well. Different ingredients have different equivalent weights too, so rice will be different to sugar, cocoa to flour, and different flours will have a different weight too. So, the rule is simple, fill your cups in the same way, scoop/level/compress, however you choose, and the balance in the recipe will be good. It is not a good idea to mix cup measurements with another method, it is unnecessary, and will not be good for your recipes. You have to trust this system, if not, get a digital scales, it will be the most accurate of all! Could you tell me how much 6 oz of chopped chocolate to Grams and Cups…? One cup = 6oz = 175g of chocolate chips. I went through the conversion chart it’s great but are you sure the conversion given are correct coz I checked the same in internet and found that yours conversion chart is a mix of USA and Australia conversion. Please let me know if I am correct. The problem with chopping and changing is that you get a different result. Cup measurements are not meant to be weighed. These are measures of volume. What matters is that they are consistent. If you are using the same cup, in the same way, the balance will be right. You have to trust this! Cup measurements were an informal way of measuring, before people had weighing scales, any cup would do. When I would give you my recipe I would say cups, and you would use your cups, and they may be bigger, or smaller than mine, but it did not matter. These measurements have only been standardized in recent times. like (flour+sugar+bkg pwdr+bkg soda) : (butter/oil+milk/yoghurt+Puree). This is not a way to describe baking! Ratio works for some cakes, but there cannot be a general rule. There is a standard Victoria sandwich/pound cake recipe for which ratios are appropriate. I say 4 + 4 + 4 + 2 plus a little milk. That is butter, sugar, flour and eggs plus milk. This is easily scaled up, or down, so 5 butter, 5 sugar, 5 flour 2 1/2 eggs (or three small ones) a little milk if needed. And on and on. It does not then matter which style of measurement you use, but I use imperial/ounces. Pastry tends to like a higher proportion of butter to flour. You work out what suits you and creat your own proportions for this. Hi Gemma. Thank you so much for sharing these tips. I’m a beginner and I get very confused about oz, grams and cups. But your chart has made it so easy for me to figure out the perfect measurements. Thanks again! Haha! actually this is how a lot of good cooks bake, it is a great way to get a sense of what works and what does not work. Cup measurements started out as being your kitchen cup, it did not matter what the size or weight was, just keeping the proportions right in a recipe. It much later on became a recognised measurement of weight, but the old way still works! Thank you, so good to have you with us all the way away in Indonesia! I am a great fan of your cooking series. However i am vegeterian. We donot use eggs at our home. So if you can help me with some egg substitutes or some vegeterian recepies it would be fantastic. Also i am not very fond of the all purpose flour. Any replacements for that would be very helpful. I would also need your help with the temp songs for a 19 litre OTG (without fan). I had made the carrot cake following your recepie. It came out fantastic. Everybody in my family lived it. I sent some to my daughter’s school as well and people have become fan of my banking. There is an egg substitute chart here on my website. The one you choose will depend on your recipe, different ones for different purposes. All purpose flour is plain flour, generally wheat flour. for some recipes there will not be a substitute which will suit. go back to my recipes here, you will find a flour substitute chart here too. Wheat flour is best for a lot of recipes, but can be substituted in some, it is a learning curve. OTG ovens are usually really small, and 19 liters is small! Hi Gemma I just wanted to say that thank you for making this chart, it will really help me when i am baking because i don’t have a weighing machine. 1. to get 1 cup, do we fill the cup or scoop the ingredients? or is it the same? 2. if 1 cup = 240 ml, and I have a little bowl that has a volume of exactly 240 ml, can I use that bowl instead as a cup measurement? actually I’ve tried this method yesterday but 1 cup is only 124 grams. is that okay? Maya, do not confuse yourself. Cup measurements were developed before people had access to kitchen scales. A cup back then was whatever you had in your kitchen, as long as you are consistent in your measurement, it does not matter how you do it, it is all about proportion. the link didn’t work for your conversion table. please provide the correct link. I would love to have it. The chart is there when you scroll down the page. Click on the chart and it will open in another window. you can download it form there. Hope this helps. I am so glad I found you on you-tube, just love microwave cup meals. Hi Gemma, I have to say a Big THANK YOU for this wonderful chart, also every one of your recipes! You explain the “how too” in such plain speaking that I really appreciate..You make it so easy for us..
I’m not one for commenting and am rather shy but I had to at last let you know how I love seeing your name pop into my inbox. Have a Happy, Healthy 2017 my dear ? Thank you, that is too kind of you. i will add your suggestion to my list, that is a good idea. Great. Thanks again Gemma you’re a Star ? 1) Gluten free or vegan substitutions for flour in any recipe. 2) A video named “Ingredients 101” about the baking ingredients that which are important and which are not and how to use them like gel food colours and powder food colours etc. Thank you so much for these great suggestions, I will add these to mt list, to test, particularly the ‘magic cake’ I do not know if this will work in the microwave as it relies on a particular method and time of cooking, I will think about it! Can you also make molasses and light and dark corn syrup in bold baking basics? You have made a flourless chocolate lava mug cake on your channel. Which things and techniques make this cake flourless? Can you also tell that if a recipe calls for gel or liquid food colouring how much powder food colouring should be used in the ingredient 101 video? Can you make a chart on food colour 101 and flour substitutions? Wow! a lot of good questions! Flourless recipes do not use flour, of any sort – usually relying on eggs – almond meal insead of flour. Cake flour is used for pastry and cakes to make a softer crumb – it is a reduced gluten flour. Use the powdered color cautiously, you always judge this as you use it until you get the color you want. Love it, Love It, LOVE IT!❤️?? Have been looking for something that has all the basic baking measurements in one place. You have aced it! Thank you Gemma? Right on!!!! I’m over the moon to hear that. Share it with friends on Facebook who might like it also. Very handy chart as not every recipe gives alternatives so a BIG thank you. The other difficulty I seem to get is that often when following a USA recipe they talk of sticks of butter. Not very helpful to those of us whose butter comes in one lump, weighing 250 grams. Haha! Sue, the English language too is different here in the USA! Thank you Gemma, this is a godsend. I am forever looking up the conversions. I so appreciate this New Years gift. Blessings to you and your family for a happy and healthy and successful year ahead. I’m thrilled to hear that. Coming form Ireland I knew people all over the world who don’t have access to cups would find it helpful. First let me start with absolutely love you and your channel. Second thank you for sharing your ideas and recipes with all of us. Finally I love this chart have been wanting to make one but haven’t found the time. I’m from the US and was taught the cup method. I know how inconstant that system is, but all my family recipes are written that way. Now I can and adjust them to be just like I remember as a kid. Thank you. That is great. Yes, the inconsistency is hard for people who did not grow up with this to understand! yet is has been a reall successful way to measure, based on volume and proportion really. in baking like chocolate, nuts, peanut butter, maple syrup/honey? I tend to use the cup to scoop, is this what you mean? It saves me having too much equipment around when I am working on recipes. I didn’t know if you scoop the flour with the cup or if you use a spoon to spoon the flour into the cup and then level it off with the back of a knife. Hopefully that’s more understandable. 🙂 Sorry about that. Thanks! Happy New Year to you too! I usually scoop it, shake off the excess, and tap it on the counter to settle it. I do it by habit, this is the first time I though about it! Cup measurements need to be trusted, they originated at a time when people did not have scales, and a kitchen/tea cup was used, as long as you use it consistently, for each ingredient, the proportions will be right, and it will work! Fab. Thanks very much. Most useful. The Boot Camp sounds like a great idea. Can’t wait. Thank you Sally, on your marks!! This is shivani from India. I’am a huge fan of your channel and follow all your baking tips recipes. You doing a great work. You are a huge inspiration for young bakers like me. Keep up the good work. Can’t tell you how much I love your recipes and can’t wait every week for a new recipe from you.I’m from Mumbai,India and sometimes I find it a little difficult to procure the same ingredients that are used by you.Would you be kind enough to please let us know if there are other alternative ingredients that can also be used in your recipes.I’m really looking forward to many more yummy recipes from you!! Thank you soo much for this chart I just had difficulty in finding out the sugar nd water three days ago… Thanks again? Thankyou for the chart. Very helpful.. will surely pass on the link to all my baker friends. This has got to be one of the most useful baking charts, so thank you so much for it! I was just wondering are the cup measurements US cups or metric cups because I know there is a slight difference. I’m delighted that you like the chart. Hum so I haven’t heard of metric cups nor have I seen them. i just did some googling and I think they are the same. Hmm, apparently 1 US cup is equal to 0.95 metric cups. So there’s not much of a difference but it could possibly affect the results, I suppose. I assume though, since you live in the US you would be talking about US cups in the chart? This is the connundrum, I use a cup within the bounds of US standard cup, though there is a little tolerance in this. AP/plain flour for instance in a US customary cup runs between 4.2 and 5 oz, 120 – 140g. Metric cup 4.4 – 5.3oz, 120 – 150g, it is not an exact science. What matters in measurement is proportion, stick to one way of measuring, invest in a digital scales, this will always be the most accurate way. Cups measure by volume, this makes it confusing enough, the varience between one cup type and another adds to the complication! don’t get me started on the Australian tablespoon!! Thank you for this amazing chart. I have something similar but not as clear as this. I love your recipes. We just recently made your gingerbread crock pot cake. It was delicious! We look forward to making more of your recipes. I am really happy to hear you like the chart. I hope you get a lot of use out of it. It’s handy to have it all in the one place. P.s the gingerbread crock pot is hands down my favorite dessert I have made. I’m making it again for my birthday this month. This is very useful! We don’t use cups in my country either, so a conversion chart is much needed. Thank you Gemma. I’m thrilled you like it. Happy baking with it. I love the idea of your baking bootcamp, but these weights are off. Most people refer to the King Arthur master ingredient weight chart which cites a cup of flour as 120g, sugar 198g, cocoa 85g, etc. These measurements have never steered me wrong, but adding 30g extra flour or 40g extra sugar definitely could! These measurements are based on my learning and experience. You might notice other charts vary and that can be for multiple reasons (e.g. different flours weigh different amounts or you scoop rather than fill your measuring cup). I measure each 1 oz as 30g, not 28g. As long as you consistently use my chart for all of the ingredients your recipe will work out great. I am a huge fan of king Arthur’s flour. I’m sure you have seen on their website that even thy comment that different flours have different weights. As long as you consistently use my chart for all of the ingredients your recipe will work out great. I’m sorry to be a stickler, but I weigh practically everything in grams & agree with Jeremy. Through my own experience, & trusted sources (ATK, Serious Eats, King Arthur & a few others) I’ve listed dozens of common ingredients & use it all the time. For instance, every stick of butter I’ve ever seen states that a tablespoon is 14 grams. That means 1 cup is 224 grams, not 240. I’ve also never seen a cup of granulated sugar be more than 201 grams, not 240. Regarding flour, King Arthur uses the fill & sweep method (120 grams) as opposed to the scoop & sweep, which is 130-135 grams. I just love all your recipes and I am sure this will be very helpful while baking. Thankyou so much! Love you lots! Thank you o much for being apart of the community. I’m thrilled you like them chart :). Thank you so much for everything you do in order to help us make your awesome recipes!! In Spain we only use grams because there is no cups measurements so I am very grateful that you made the baking conversion chart, I am sure it will be very useful! P.D. Sorry if I am not writing correctly in english ? I’m so thrilled to hear that. In Ireland I found it impossible to do a recipe with cups so I’m thrilled that people in my same situation will find it useful. Hi gemma, thank you for this very handy chart it would save me a lot of work . Good luck for your new baking series . you are so welcome. Delighted you find it useful.